on the roadside, Anaga Ridge. The endemic flora of the Canary Islands is incredible, and Tenerife is arguably the most exciting island in the archipelago for its plants. The Canary Islands sit out in the Atlantic Ocean off the coast of Africa, and have a very variable climate, ranging from the wet, warm and temperate island of La Palma in the west, to the hot, arid island of Lanzarote in the east. The flora of the Canary Islands is dominated by a number of genera such as Echium, Aeonium, Sonchus, Pericallis and Euphorbia. 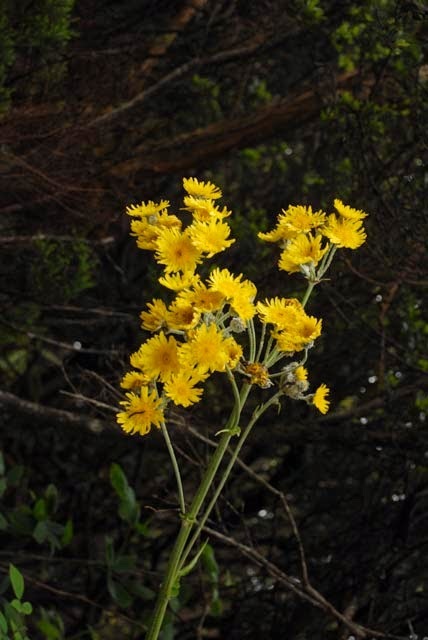 One or two endemic members of genera such as Lotus and Limonium are also a fascinating feature; in fact the flora is so rich, it is difficult to summarise it by mentioning its important genera. 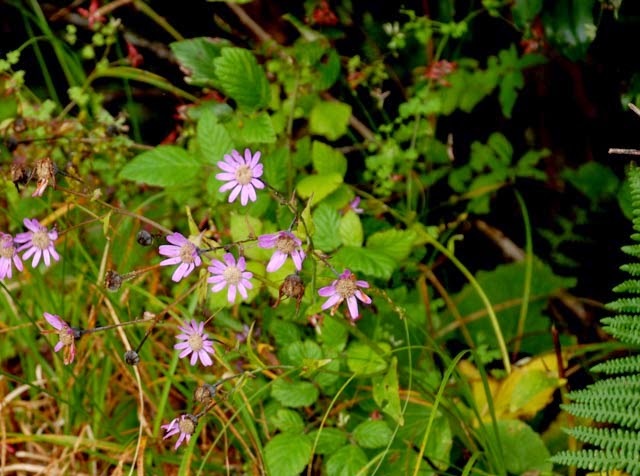 Looking at the flora of other Atlantic Islands, they are not as rich. Madeira has a few members of the Canarian genera, while the Azores and the flora of the Cape Verde Islands share little in common with the Canarian flora. A question that has been asked many times is; ‘where did this flora come from?’ One answer is that it is a remaining fragment of the flora of the African Sahara before it became a desert. However, the fringes of coastal, Mediterranean Africa and the mountains of Morocco, which have a relatively similar climate, bear little resemblance to the current endemic flora of the Canary Islands. There are also one or two genera with a beautiful single species in the Canary Islands that have no close relatives elsewhere. These include the beautiful bellflower Canarina canariensis and the member of Scrophulariaceae, Isoplexis canariensis. Limonium sinuatum in Gibraltar is similar to the endemic Limonium species of the Canaries, but Europe has none of the extreme Echium species such as Echium wildpretii, simplex and pininana of the Canaries, neither are there any Aeoniums or the wonderful member of Sonchus that grace the Canarian flora. Even the far out possibility that the Canarian Flora is botanical proof of the existence of Atlantis has been aired. It was in May this year that my wife and I spent ten days in Tenerife. It was primarily a relaxing holiday, but nonetheless, we had a chance on several occasions to botanise in the Island. 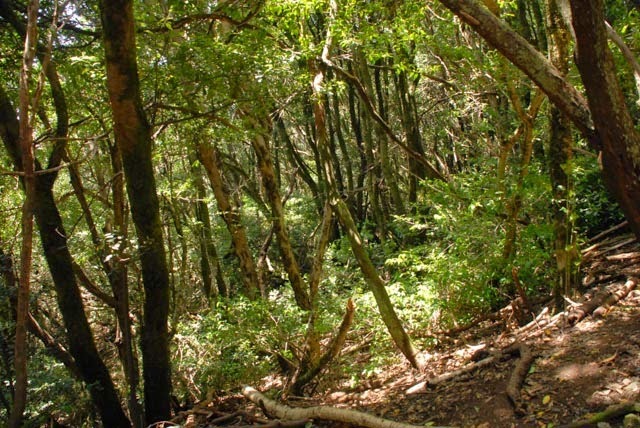 The main botanical areas of Tenerife are very different from each other in character, ranging from wet and frequently fog-bound on the Anaga Ridge in the North West, to the high mountains and the Teide Volcano in the centre, to the semi desert of the south east. The sea cliffs of Teno and the rugged countryside in the Masca area also are a must for any visiting botanist. 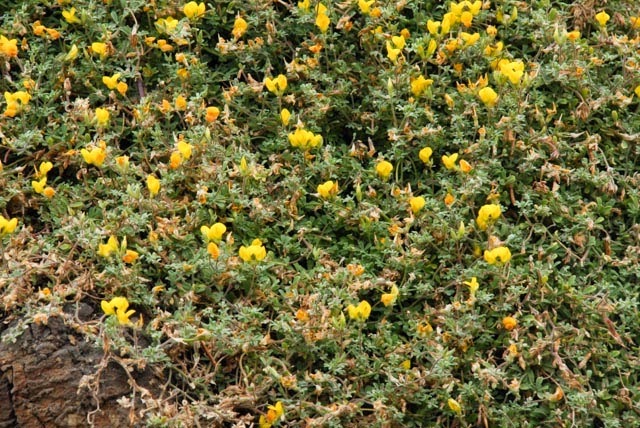 Before leaving for Tenerife, I had heard that the extremely rare Lotus berthelotii, now confined possibly to a single wild plant, was not infrequently grown in private as well as public gardens. Although expecting little help, our first port of call on arrival was to the Tourist Information Centre in Puerto de la Cruz. To our delight and surprise, the members of staff on duty had a considerable knowledge of the flora of Tenerife, and shared with us some vital information, one man in particular. He told us of a collection of Canarian endemic plants to be found close to La Laguna, a city whose centre is a World Heritage Site, and is between Santa Cruz de Tenerife, the capital and Puerto de la Cruz where we were staying. This was somewhere we determined to go and see. Secondly, we were told that a terraced garden in Vilaflor to the south of the Canadas and Teide contained a fine collection of Lotus berthelotii. In fact a young female assistant told us that she had it growing in her own garden! 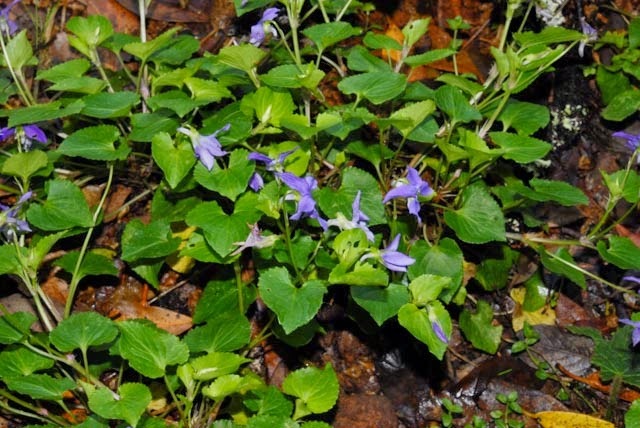 He also told us of a place where we could see the endemic Viola anagae easily on the Anaga peninsular. Our first task was to collect our hire car. This proved to be a Volkswagen which had obviously been mishandled by previous hirers as its performance was very slugging. I was the driver, and in order to get used to the car, I decided that we could visit the relatively close Anaga Ridge where I could get used to driving on the right, and to the car. Since our last visit, the population of Tenerife has grown astronomically, and we had to pass through area of suburb after area of suburb. Eventually we managed to stop at a viewpoint where I was delighted to find Lotus dumetorum. 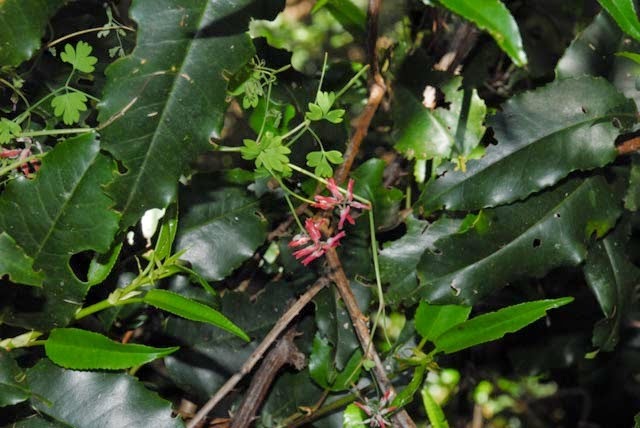 Although not a distinctive species, it is nevertheless endemic to the Anaga Ridge. 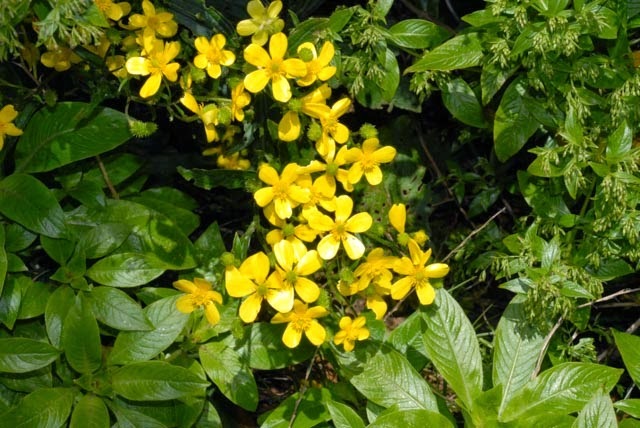 We then found a place for lunch, and on the edge of woodland close to a fine restaurant, I found Viola anagae very easily. After a superb lunch of deep fried squid, we enjoyed a walk through some fine laurel forest, much of which had considerable ecological continuity. One problem that I do not remember as being so acute in the past, which is particularly annoying to a visiting botanist, is that there are very few places it is possible to park. As we drove on towards the western end of the Anaga Ridge, a fog settled in which added to the dangers of driving in Tenerife. The locals, to say the least, are not sedate in their driving and lunatics on the wrong side of the road were not unusual and highly disconcerting. However, there was a convenient parking area a few yards after I had noticed a couple of fine Sonchuses on the roadside verge. I stopped and walked back. 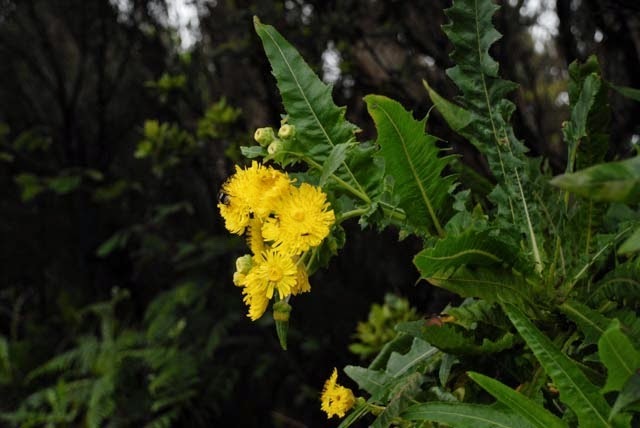 They proved to be Sonchus congestus and Sonchus acaulis both in fine flower. 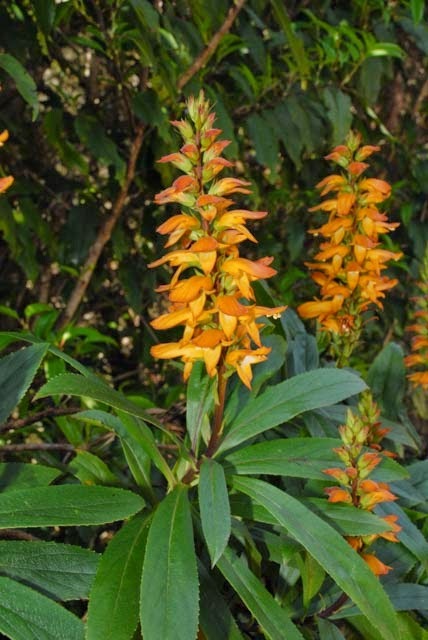 Just opposite where I parked the car was Isoplexis canariensis in perfect condition, and on the road opposite Sonchus acaulis, I found Fumaria coccinea. Also opposite the Sonchus acaulis there was a particularly fine area of laurel forest, where I found some fine lichens typical of damp conditions such as those in north western Scotland. On my way back to the car, I saw and photographed the beautiful endemic Pericallis tussilaginis. Quite a haul for such a brief stop. Conditions now really clamped down, and we decided that to continue on the Anaga Ridge was asking for trouble, so we descended down to the coast, and made our way back to Puerto de la Cruz. This is the first blog instalment covering our visit to Tenerife. I still have so much else to cover, including the wonderful Acclimatisation Gardens in La Orotava on the edge of Puerto de la Cruz as well as the incredible flora of Las Canadas and the Pine Forests that surround it. I have also botanised in La Palma and La Gomera, as well as more briefly in Fuertaventura and Gran Canaria. I hope very much to make these blog entries a series of complementary writing for my daily, or near daily Tweet of flowering plant species from around the world, which has attracted a warming level of interaction.